The famous cyber hacker group Anonymous has vowed an 'Electronic Holocaust' against Israel in response to what the group calls 'crimes in the Palestinian territories'. In a spooky video "message to Israel" posted on YouTube March 4, Anonymous declared yet another cyber attack on April 7, which is one week before Holocaust Remembrance day. Totally in news delivering style, the video clip shows a man wearing an Anonymous mask and threatening to take down Israeli servers and websites related to critical infrastructure next week, promising to 'erase you from cyberspace'. "We will erase [Israel] from cyberspace in our electronic Holocaust," says the video. "As we did many times, we will take down your servers, government websites, Israeli military sites, and Israeli institutions." The cyber activist group declared Palestinians youths as a 'symbol of freedom', and urged them to "never give up. 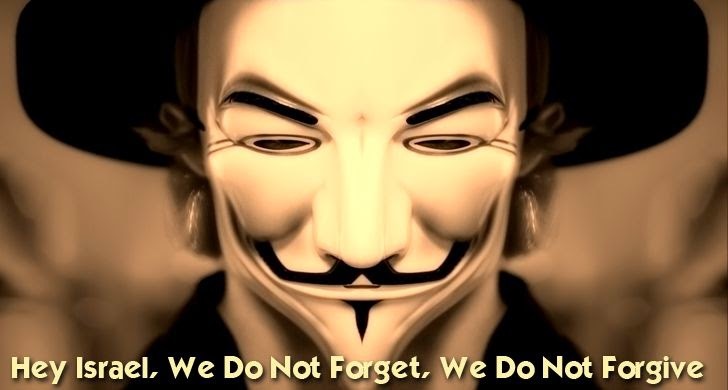 [Anonymous] are with you and will continue to defend you." The group criticized the Israeli government, saying that they have not stopped "endless human right violations" and "illegal settlements." The video subtitled in Arabic and delivered in English electronic voice, possibly to hide the identity of the real person. The footage includes images of Israeli Prime Minister Benjamin Netanyahu sitting with military leaders and members of his cabinet, as well as images from the Gaza conflict. The video also shows images of injured Palestinian children and bombed areas that appear to date from Operation Protective Edge conducted by the Israel Defence Forces (IDF) last summer. "[Israeli government] killed thousands of people, as in the last war against Gaza in 2014. [Israel] have shown that you do NOT respect international law," says the electronic voice, promising "We are coming back to punish you again." "We always say expect us but you always fail. We are unexpected; we’ll show on 7 April 2015 what the electronic holocaust mean…," the video continues. Anonymous then continued with a message to the "foolish Benjamin Netanyahu, and all leaders in the Zionist entities" warning that cyber attacks on Israeli government websites, sensitive data and devices will continue "until the people of Palestine are Free." In past, Anonymous has targeted Israel a number of times. A cyber attack, called OpIsrael attack, in April 2013 claimed to have caused $3 Billion worth of damage to Israel, when the group targeted about 30,000 Israeli bank accounts, 100,000 websites, 5,000 Twitter accounts and over 40,000 Facebook pages. Past targets of the the hacktivist group includes official websites of the Israeli prime minister, the Bank of Israel, the Israeli Defense Force (IDF), the Embassy of Israel to the United States and the Israeli President’s official website.